Does your clothing define you? All of my life I’ve focused on accenting the good and de-emphasizing the bad when choosing my wardrobe. As I am 5’4″ and have a curvy figure that has meant lots of figure hugging, waist cinching clothing with some kind of heel. With age I can see some unwelcome changes in my body which are forcing me to reevaluate my preconceived ideas of how I dress myself. The feet want comfy shoes and the sometimes fluffy waist doesn’t always look best defined. It’s a slow process learning to give up long held beliefs. I’ll be the first to admit I’m not quite there yet. I wore a 1950/60s vintage gown for a photo shoot during my last blogger meet-up and upon reviewing the images my heart sank. I didn’t like how I looked. It made me look substantially larger than I am. This influenced my behaviour. I felt inhibited, self conscious, less vibrant and funny. Why? I was still the same person under that dress. In the photos I no longer saw myself. The person that I feel and believe I am would not be the person everyone else would see. I’d share some of the offending photos with you but then I’d have to kill you. I made sure all incriminating evidence was destroyed. Wearing shift dresses without a belt is still a big leap which can, depending on my body confidence that day, make me feel unattractive. I find the thinner I am, the less likely I am to have a problem with wearing oversized clothing. The larger I am the more I dislike it. I want people to know exactly where my body ends. I don’t want to feel like I’m covering up or trying to hide something. My collection of shift dresses has been growing since I passed fifty a couple of years ago. I am very aware that shift dresses add visual weight. Often put my hands on my hips in photos when I wear this kind of dress just to prove that, yes…I do still have a waist and here it is! So many women after a certain age wear floaty shapeless clothing and look amazing in it. Are they so empowered that they no longer care if they add visual weight to their physique? Do they just want to be comfortable? Or have they moved past caring? There is a fine line for me between not caring, being comfortable and simply giving up. If I were thin and tall I’d be happy to wear oversized items regularly. The clothing wouldn’t be covering up a secret I’m trying to hide. I found this wild and crazy oversized kaftan thrifting a while back and wanted to see how it would make me feel. I was attracted to the bold, bright, oversized florals and the dramatic swishy-ness of the piece. Could I make it work for me though? Would I feel like Mrs. Roper or would I feel like myself? Would it make me feel older and heavier than I am? There is no doubt this adds visual weight. It’s like wearing a tent disguised as a wildly blooming garden. The infamous “here is my waist” pose. This piece comes alive when I’m moving, creating blurry bold swooshes of colour and fabric in my wake. It is very Melanie. Sadly, I haven’t learned how to capture the movement with my camera in the small space where I take my photos. Upon reviewing the photos I’ve decided I can’t do it. I’m still adverse to wearing oversized, shapeless clothing, in particular, kaftans. I’ve analyzed the problem and the dress doesn’t correctly communicate how I want people to remember me. It’s not properly defining the way I feel about myself. It’s close, the colours, the boldness but the shape is a miss. I think this bright kaftan will be showing up in my Etsy shop soon. Some fabulous, artsy, confident woman will buy it and feel like a million bucks. How about you? What type of clothing makes you feel less “you”? Linking up with the lovely Patti for Visible Monday and Jess for Turning Heads Tuesday. I get this in so many ways, Suzanne. I go through phases. Sometimes I put on something and think, “This looks so snazzy!” A few months later I put the same thing on and don’t see myself at all. And if I’m not wearing something that expresses who I am/how I feel, I feel completely off. My clothes and hair definitely are expressions of who I think I am and how I feel about that. PS: I just bought a caftan too! I’m planning on cutting it up to make a jumpsuit. It’s so much fabric! I’ll keep you posted how it ends up. I’m looking forward to seeing your jumpsuit! Wow! Your sewing skills are progressing quickly. Goodness, girl, I think you look fabulous in each and everyone of those photos! I know what you mean about feeling like ‘me’, however. I think that having a haircut that is who you are is absolutely crucial and your hair looks terrific. I get the feeling that you could throw on any old thing and still look good. Yes, I agree, the one thing I’ve gotten right is my hair. It’s both stylish and effortless. I’m sure you find the same with your cut. I agree with Miss Cellany that you look good in every-darn-thing, and you can’t help that. You being you has enough energy and allure to make the shape of the dress less important. But I am with you on having pieces that feel most like yourself, in any setting. I don’t doubt you fit right in with that chic NYC crowd. Feel exactly the same as you! I also have an hour glass shape and if I don’t wear waist defining clothes, I look a lot larger than I am. I don’t necessarily see it as a problem- if you know the styles that suit you, you can adapt anything to work. I just try to avoid boxy jackets (most denim jackets are out) and loose kaftan-y type clothes. I still manage to wear jean jackets, I just make sure they are fitted and I usually wear something tight fitting on the lower half to balance things out. I’m very sad that other boxy jackets don’t work for me though as I do find lots while thrifting that I have to leave behind. I can totally relate, Suzanne! I always like fitted pieces better, but of course that’s what I’ve been taught my whole life. Yet I think certain shift dresses still can look marvelous too—I like the idea that they skim our body but don’t have to be tight. Whereas your caftan is pretty but in my opinion overpowering. Not that it’s a bad thing, just different than what we are used to. I also love the idea of something skimming the body but no longer being constricting. It feels like wearing freedom on your skin. I agree…this kaftan is for someone with a huge personality. Your point is so true and sharp that it penetrates like a knife. Yes, fashion expresses our identity in profound ways. I like hearing your reflections on how shapes and styles work and don’t work for you. That’s educational and interesting. For me, simply wearing a dress or other feminine garment unleashes a suppressed identity more powerful than anything people can imagine. I imagine that out of everyone I know, you understand better than all of us just how much clothing influences our identities. Clearly, our clothing choices need to feel right. I just want to chime in and say how I don’t see that this adds visual weight. (I can see you looking aghast right now. Waving your arms wildly. Hahaha!) I see a big swath of fabric, sure, but it clings to bits when you move, which is a cue to your body size. Just sayin’. But why wear it if it makes you uncomfortable? So, yeah. And, knowing how you feel in this dress, I applaud you for putting that photo as your opening shot. Wow. You’ve got a big v for sure for having the guts to do that. I would think this dress will sell fast on Etsy. I LOVE the caftan, and would totally wear it! I don’t know if it would be flattering, but I would enjoy wearing it, and I think that’s half the battle. I’m with you re the changing in dressing. I always had a very small waist, which balanced my larger hips and thighs, but now as I get older, I don’t have such a small waist, and so am gravitating towards shift dresses, which I don’t hate. Oh, and I think you look great in the caftan, but if you’re not comfortable, it’s not worth it. 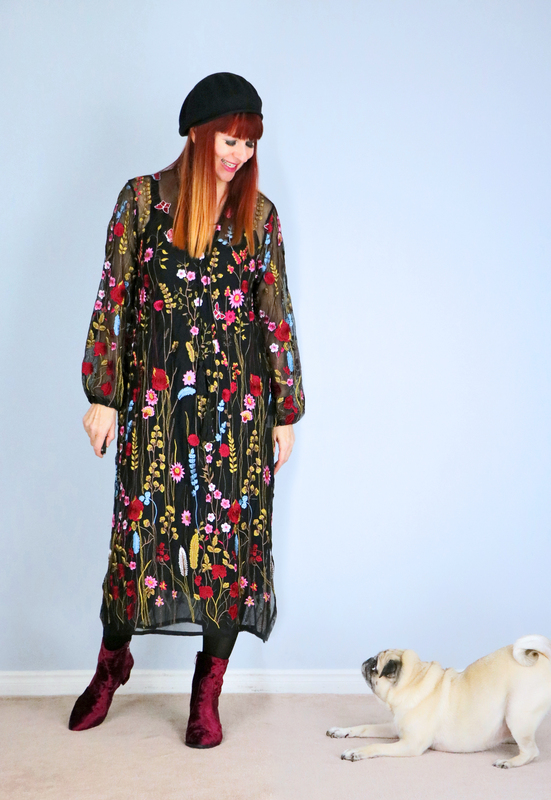 Anyway, is there any chance of purchasing the caftan before it goes into your etsy store…? First of all you wear all of these pieces very beautifully. I’m glad to see you wearing that color drenched caftan, sometimes they do not look great on as we stand still in front of a mirror, but as we move they can be very beautiful. I also like to be thin because it allows me to wear clothing much more easily, even if the styles are particularly flattering. I find that if the dress has pockets I can use that, and it becomes visually smaller. I also love having pockets. Like you, I do feel much more self-confident in clothes that fit me well, and are well made and distinctive. 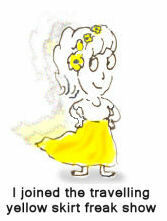 But I can no longer wear clothes that are uncomfortable nor shoes that I have trouble walkingg in. Also, I am drooling over that fabulous embroidered black dress. !! Golly Suzanne, these could be my words exactly! I too seem to define myself by the size of my waist and the outline of my figure. I’m totally vain and can’t imagine ever changing. 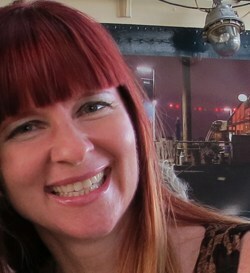 There was a time when I was quite chunky and yes, it really got me down and didn’t show how I really wanted to feel. Luckily or unluckily depending on how you view it, my health issues have taken me down the route where a restricted diet to keep me and my gut well means that I am slimmer than I have been for years. Every cloud, you might say. And yes, I totally agree with you about the voluminous kaftan look working on the willowy Mel but not for those of us who are shorter and wider than we wished. Thanks for voicing this. I’ve been restricting my diet as well but so far it hasn’t worked for me. I just I just need to keep trying. and you look pretty in it – in my eyes. Ah yes, I fear the older I get the fewer belts I shall wear. I think that anything looks good on you. It’s your personality that give the look the thing! But I do agree that in some things weer look heavier then we are. I totally agree with everything you say. Most of the shift dresses you show, still look really good on you, although I prefer a little more flesh showing at the neck. Most of the vintage dresses are very high up and I think a little scoop is nicer for you (IMHO). The first black dress you show, is super though. I can see your waist here. I think you just have to find out what the solution for you will be. I tryed two skirts on from two years ago and I looked like a stuffed whale. I was so disgusted that I hit the no sweets, no alcohol (easy for me), hardly anything between the three meals and everything low calories. I call it my lettuce and water diet haha. (Joking of course.) I finally reached my desired 63 kilos. I was 66 (you work it out in lbs). The skirts fit again. Only with aging I shrink and therefore got a stomach moving forward. That is hard. I still cannot wear any figure hugging tops. Nor cleavage showing or arms showing (3/4 sleeves)… pfff.. I can look forward to the day when I don’t give a damn anymore that I show wrinkly arms. It will be a liberation. Until then… I struggle. We had a discussion today on that subject. Just when do we learn to love the bits of us that we don’t really care for as we age. We decided that it probably never comes but we keep moving forward past it because there isn’t another choice. There will be a day. Like I always wanted a dermatologist to remove the spots on my legs but never took any steps. Now there are so many that I don’t care anymore. Perhaps I will feel like that about my arms too. When all is lost and I look old anyway haha. When I think of your “signature look”, your hair always comes to mind first, so I still see “you” in that bold print caftan. You have a gorgeous hour-glass shape, and the styles you wear emphasize it. I get what you mean about oversize pieces making you look and feel larger, and my summer wardrobe consists primarily of oversize linen pieces. I feel self-conscious about having a thick waist so I tend to choose pieces that camouflage it, and with the extreme heat we’ve had this summer, I can’t deal with wearing something touching my body. Oddly enough, I’m fine with wearing body-conscious outfits in the winter. I agree wholeheartedly when the humidex reaches 40+ I cannot stand anything around my waist. This summer has been very hot and humid. I’m crossing my fingers that does not mean we will be suffering with a cold winter. I can relate and felt a way when I wore my white summer dress. Only when I took a good look at the photos I thought I was fat in the dress. When I was walking across the avenue in said dress I felt Fabulous. I guess fashion is really a state of mind. I do think fashion still defines us to a certain extent. Uniforms help us recognize people that can help us. I believe it is in France where they had a reality TV series where everyone is naked and no one knows what the other people do or how much money they make. Clothing helps us understand people. It defines us more than we realize. 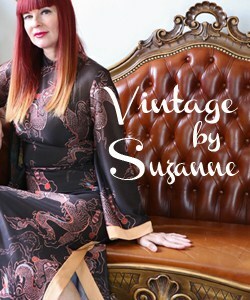 I really love this vintage kaftan you’re wearing and I think you look fabulous in it! However I agree on this kind of oversized clothes adding visual weight on any frame and probably looking less flattering on you than fitted clothes. But the print is so beautiful and you look so lovely! Sometimes I wear unflattering oversized clothes, without remorse, because it’s hot, I like the print or the shape is interesting. Without remorse!. Sometimes fun factor wins!. I’m becoming wilder as I age! Learning how to embrace change is the challenging part I find. I really like your kaftan and you look fabulous wearing it! What amazing colors! However I agree on oversized clothes adding visual weight and fitted clothes looking more flattering, but sometimes I wear unflattering oversized clothes just because I like the print or the interesting shape. Actually, I feel comfortable wearing some unflattering clothes, even comfident, so probably I’m embracing a relaxed style as I age! sorry, I thought that internet has eaten my comment! so I wrote it once more! I get this. i wear shift dresses and I seem to do the same, put my hands on my hips or nearer to my waist as they don’t define the waist. i dont know that I think about it much. I used to only wear more form fitting clothing to show that i have a figure, but I think because of blogging having tried things i wouldnt have normally. i bought a pretty large poncho – in my size, but shaped like a giant square winter poncho from Zara. When I looked at it, I thought OMG, this is giant. When worn, it drapes nicely and looks much better. I think a kaftan would look like an old housecoat on me.. just shapeless. interesting post! love the hot dog hem… Zoe and Gibson would both love that! This is surprising as you are very svelte. Goes to show we all have our doubts. My belly also makes me shudder! Ha! I suppose we just need to be grateful they are still in working order. I think you look fabulous in that kaftan but maybe it’s because of your huge smile and the way you look like you’re radiating confidence even if you’re feeling anything but. 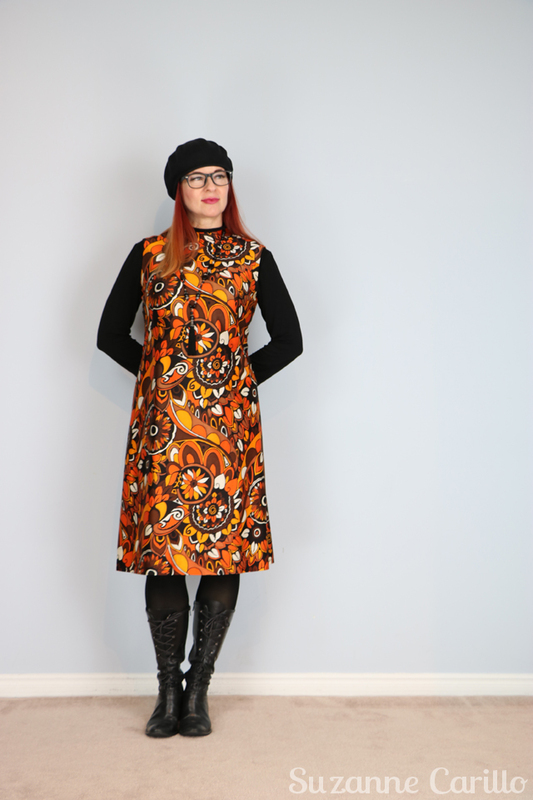 I love floaty shapeless clothing but have to admit that a lot of it doesn’t like me – I’ll waft around in a massive dress all day only for Jon to take a photo and me to hate the result. Not so much ‘cos it adds inches more like it makes me lose them (in height) – I loathe being a short arse. Shame how someone’s random comment can affect us in such a negative way. I’ve never been happy wearing a belt- even at my skinniest. Subconsciously repressing my femininity?? 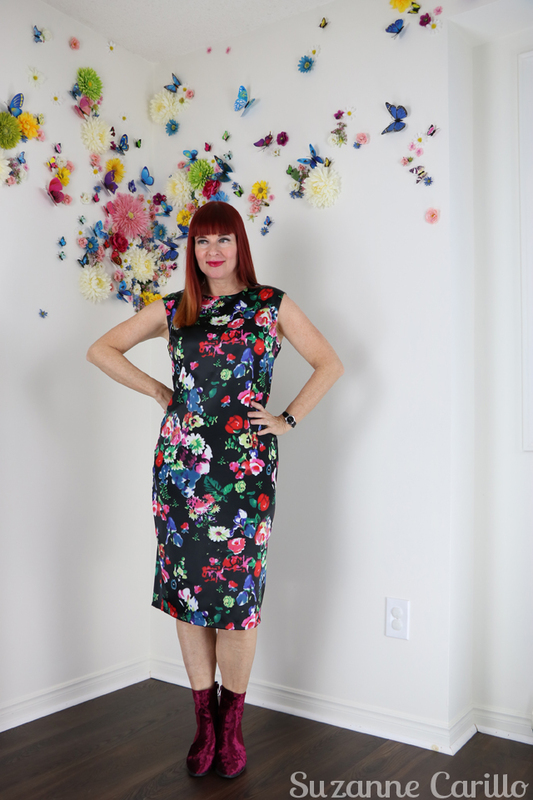 Anyway, I love shift dresses in the right fabric but I’m battling to find interesting clothing as I hurtle towards 60 and the invisible zone;) Your blog & IG posts are working to keep me inspired & visible! Thanks for popping by Alexandra! I’m happy you are enjoying the blog and IG. Visibility is a concern for every woman over the age of 35 it seems and only gets worse with each passing year. I agree that wearing belts is about femininity, probably why I like them so much. Knowing your own body silhouette and what flatters your unique architecture is so important to looking proportionately chique! Sometimes we love comfort , color , and an audible swish and it’s unfortunate that we can’t ALWAYS have them all. I agree with your point, clothing define our identity. You look so different in all the clothing. Especially, I love your outfit where you are wearing a pink boot and hat and sitting on a sofa. I adore those pink boots : ) I DIY’d the jewels onto them. Thanks for popping by Ava! I look terrible in pencil skirts or body con clothes, since it accentuates my belly and other bulges. For the rest I have to stay away from boxy colberts, shoulder pads, blouses with lapels, T-shirts and sweaters that close tight around the neck. These are things that make me look ugly. Then there are colors that don’t make me happy at all, like beige, black, dark blue, etc. I strongly believe in covering up, if it makes me look better. So I do so a lot. And it usually works, since when I gain weight, people often underestimate my weight while when I loose weight, people don’t really notice that either. It’s usually my (skinny) legs and my face that give me away. I never had a waist in my whole life. Lucky you to have had one for at least 50 years! And you still look fab! 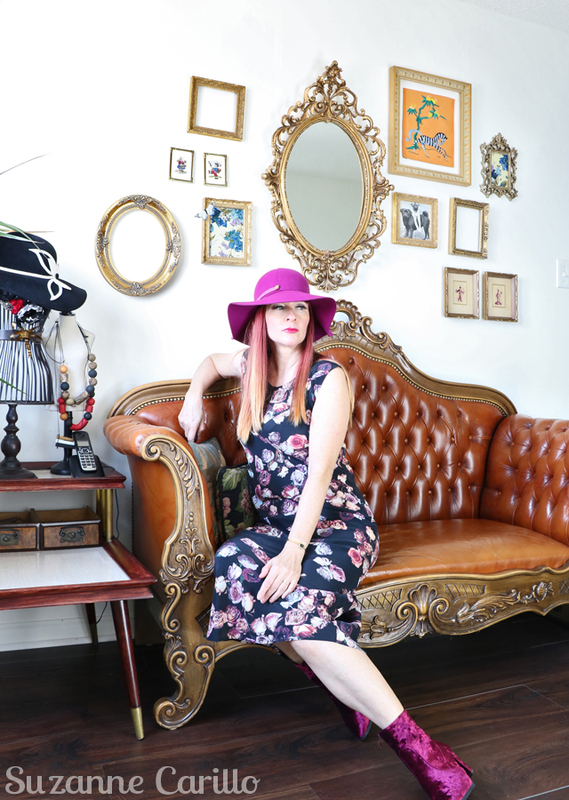 Lots of color, patterns, soft materials, romantic and boho….that’s me.